Gustavsson is 7-3-0 in January with a 1.90 GAA and .931 SV%. In his 17 starts since mid-November, he has gone on a 12-5-0 tear, with a 2.23 GAA and .925 SV%, saving the Leafs' season in the process. Gustavsson has resurrected his once floundering career and looks like a completely different goalie now in his third NHL season. "He's more confident, moving w/ more purpose, looks fully adjusted to the NA game. Team in front also responding to his play." No longer does the Monster chase the play, wildly flailing from one side of the net to the other. He challenges shooters by defiantly sitting on top of the crease, begging them to find the net, a task made even more difficult by his tall frame. He also appears to be playing more of a positional, blocking style preached by Francois Allaire, whereby you let the puck come to you. Previously, Gustavsson was trying to stab at pucks with all extremities, usually with disastrous consequences. Someone also must have told him to start eating because he now sits closer to 200 pounds, which James Mirtle thinks might be a reason the netminder looks less drained after games. Also not allowing seven goals would make anyone look considerably less drained. Now three years later, the Leafs are finally getting a glimpse of the type of goalie they thought might be an answer to their Toskalitis. Three years. In an instant gratification society, when we don't just want it now, we want it five minutes ago, before we knew we wanted it, that's a long time. With prospects, we want them to come fully developed, all the kinks worked out, please. Sometimes it's hard to remember that developing a prospect into a full-time NHLer takes time - years not months - even if that prospect was "The Best Goalie Outside the NHL". I know it's hard to sit patiently when you're losing games and the playoffs are a distant memory, but there's a long history of Toronto general managers who gave up on promising young players only to see them blossom in another uniform. It's refreshing that for once I was the one who was impatient. My ego is slightly bruised, but at least the player is still here. Now either Gustavsson has positioned himself as at least a 1A in Toronto after finally acclimatizing to the different style of play in the NHL, or he's on one hell of a hot streak. Gustavsson is an unrestricted free agent at season's end, but based on Reimer's deal that is worth only $1.65 per season, Gustavsson may come back relatively cheap on a short-term deal, at least to prove he's a starting quality goalie. Show me twice and I'm a beliver. Or Florida can make it rain on him. 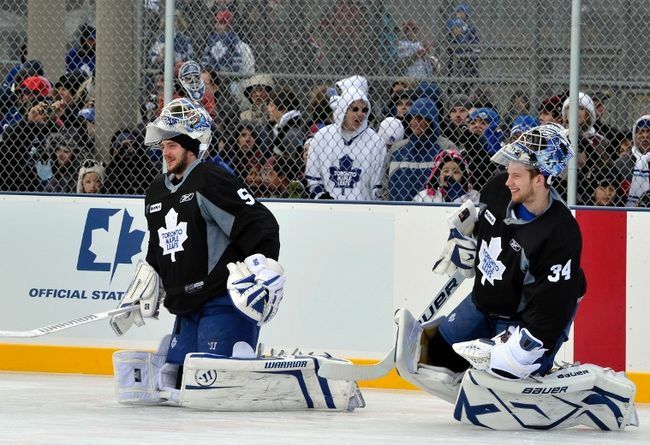 And what of Reimer, the former No. 1 and God's favourite son? Reimer has a .931 SV% at even strength this season, good enough for 16th among all goalies with at least 10 starts. That even strength save percentage is better than that of Roberto Luongo, Antti Niemi, Miikka Kiprusoff, Cory Schnedier, and even the man who replaced him, Jonas Gustavsson, who only has a .916 SV% 5-on-5. Where Reimer really falls apart is short-handed, as he has a .771 SV%, the worst of any goalie with over 10 starts. Gustavsson has fared much better short-handed, sitting at .857 SV%, just below Luongo, but well back of the league leaders. So perhaps the improved PK in 2012 has helped Gustavsson as much, or maybe more than his own improvements. If the team can continue to limit its penalties and play solid short-handed, Reimer's numbers should improve. Although it's not likely that Reimer will see any sort of extended action in the pipes to substantially improve those numbers with the way Gustavsson has taken over the crease. But what's more encouraging is that last season, as Reimer was owning the No. 1 job with a .921 SV% overall, his even strength save percentage was .933, the third highest of any goalie with over 10 games, and remarkably similar to this year's numbers. Reimer's save percentage on the PK last year was still in the bottom third of the league, but at .855, was miles ahead of this year. The thing about short-handed save percentage is that it is extremely random from season to season because of small sample sizes. Goalies just don't face that many shots on the PK, so you're prone to these wild fluctuations from year-to-year. With a potential bounce-back by Reimer, either this season or next, the Leafs will have a chance at a quality tandem between the pipes which is becoming the preferred method in the league. Most teams rather not run their No. 1 into the ground during the regular season, hoping there's something left come playoff time. It's a nice luxury if you have it, especially for a team like the Leafs, who at this point can't afford to give any game away. Gustavsson's success this season is one of the unlikelier stories on the Maple Leafs, but for as long as it lasts, I'll be on the bandwagon, just as if I never left. If Gustavsson ever has another heart ablation procedure I'll title the post "The Damage in Your Heart"